21 cm wide (8 inches). 14.5 cm tall. 17 cm depth. Beautiful finished Gothic figurine from the Anne Stokes collection. 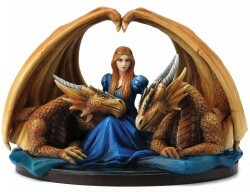 Red haired woman with two powerful and wise dragons. Solid high quality figurine with amazing detail.